Why use Nuffield Health Wessex Hospital for my knee replacement surgery? From the moment our expert consultants complete your knee operation you are in the best of care, from a team headed up by our hospital Matron. 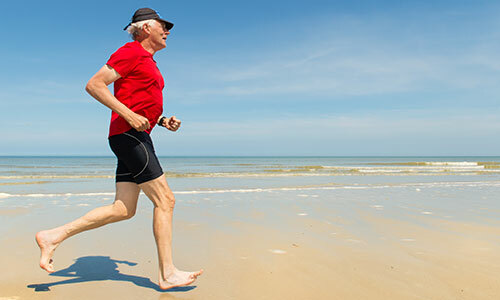 As the knee replacement involves replacing your whole existing knee joint with a new prosthetic knee joint, we know the way you approach your recovery will be personal to you. That’s why we offer a personalised plan using our rehabilitation gym where our on-site physiotherapists can show you how to make the best recovery. You will also have access to our hydrotherapy pool, where you can build up strength while keeping impact on the new joint to a minimum. A knee replacement is normally performed under general anaesthetic. During the operation your whole existing knee joint is replaced with a new prosthetic knee joint. This takes between one and two hours. Your surgeon will make an incision (cut) at the front of your knee where the replacement will be inserted. Usually, you will stay in hospital for 2-4 days, but you may have to stay longer if necessary. Depending on what type of job you do, you should be able to return to work within 12 weeks. You may want to think about a phased return to work.